The Fathima Memorial Educational Trust was established on 26-10-1991 with reg: No. 292 in accordance with Section 2 of the Charitable Societies Act. The Head Quarters of the Trust is at Pallimukku, Kollam – 10. A Younus Kunju Ex.M.L.A is the founder chairman of the Trust. The Fathima Memorial Educational Trust runs several Educational Institutions, such as, Fathima Memorial Training College,Pallimukku,Kollam -10, Fathima Memorial T.T.I., Pallimukku, Kollam. The objective of the trust is to uplift the minory and down-troden backward people in the society and not for any profit motive, for the weal and welfare of the people. The trust is undertaking a number of social service activities such as free distribution of books and clothes to the poor people, scholarships to the deserving students, medical and financial aid to the old and poor people. The activities of the trust were growing in leaps and bounds. It is because of the propetic foresight, business acumen and ingenuity of the chairman Mr. Younus Kunju, EX MLA, the founder and chairman of the trust that the trust could succeed in establishing the organisation to its highest stature. 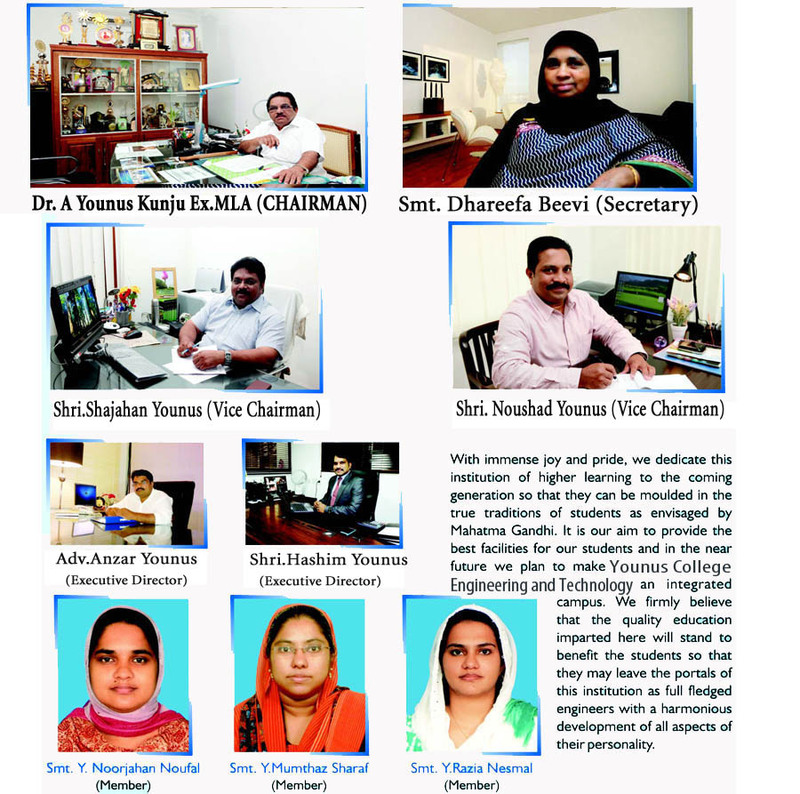 Younus College Of Engineering & Technology Vadakkevila P.O., Kollam. Younus Institute Of Technology Kannanalloor, Kollam. Fathima Memorial Training College Mylapore, Kollam. A.K.M. Higher Secondary School Mylapore, Kollam. Our mission is to educate students from all over India and abroad, including local and rural areas, so that they become enlightened citizen and technical experts, improving the living standard of their families and thereby the whole nation.